Styleascope is a lighthearted horoscope that puts a spotlight on local fashion. Believe it or not, Zodiac signs say a lot about a person. They speak to an individual's strengths, weaknesses, romantic attractions, values, desires and ... fashion sense? Yep! The stars can serve as a personal stylist, too. No sign is alike, so your wardrobes shouldn't be either. My aim is to blend fashion and the cosmos by providing a guide to show you what's in store at local boutiques (and why your sign is telling you to wear it). Instead of the runway, I'll use the stars as my guide. So, what's your sign? Like a leader of the pack, the lion is courageous, driven and bold. Leos feel best when they’re in charge, and they’re notorious for using their power to make risky fashion choices. A Leo will often wear something that no other sign would dare to think about. It’s no wonder then, that Leos are inevitably drawn to animal prints. As a fire sign, Leos suit warm colors like hues of orange, yellow and gold best. The more sophisticated and seductive, the better. 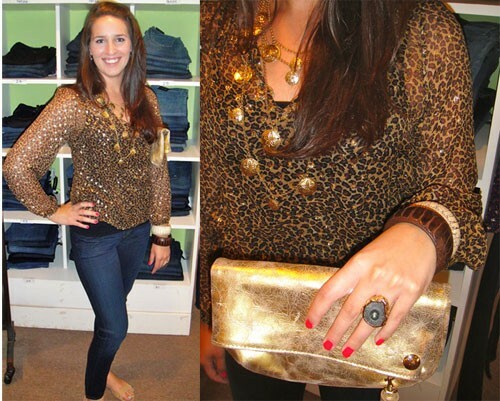 You’ll always find a Leo wearing sleek statement pieces as well as lots of gold jewelry. Leos get their burning sense of energy, individuality and creativity from their ruling planet, the sun. As the center of the universe, the Leo craves to be in the spotlight. Some say this is this perfect breeding ground for egotism, yet most Leo’s just possess a natural air of magnetism that simply causes others to gravitate towards them. Whether it’s through fashion or otherwise, the Leo exudes warmth, confidence and sophistication in any situation. All items found at Fresh, 813 Providence Road.